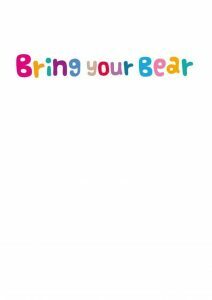 Children will be joining in the Honeybuns Nursery fundraising event, ‘Bring your Bear’ between the 3rd-7th October 2016. We will be raising funds for the children’s charity Action Medical Research. The mascot of the charity and the inspiration of this event is Paddington Bear™. Children will take part in lots of teddy bear related activities and games, with all the money raised going to a really worthwhile cause. Action Medical Research is the leading UK-wide medical research charity dedicated to helping babies and children. They’ve been funding medical breakthroughs since they began in 1952 and have spent more than £110 million on research that has helped some thousands of children’s lives and changed many more. Every pound raised from this event will help fund studies that could one day help children like Katie, who was born two months early and needed resuscitating at birth; little Cieran, who was left scarred for life by meningitis, and Jack who was diagnosed with a brain tumour at just 14 months old. So please remember to bring your child’s teddy bear to nursery on Week Commencing 3rd October 2016 along with a two pound donation. Best wishes to all our new school starters! 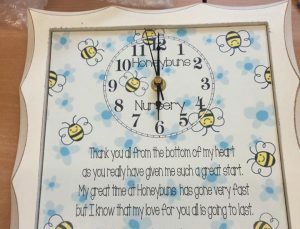 Thank you to all of our kind generous parents for your lovely words and gifts that we have received at nursery. 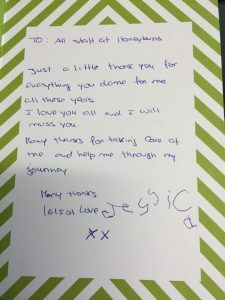 It’s always sad when we wave goodbye to the children going off to school, however we are always exceptionally proud of what they have achieved at nursery. 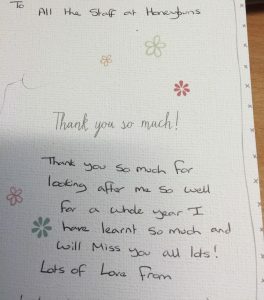 It has been a pleasure to help and watch them grow into wonderful, clever little people. 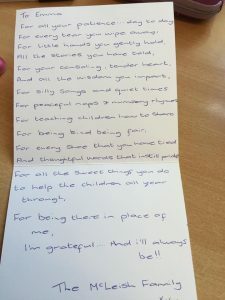 Your kind words make it all worth while and all of our staff would like to wish the children a very happy start at their new school.